The Mesa ETP foam delivery fire suppression system is an efficient method to extinguish rim fires on floating roof storage tanks located in refineries, pipelines and tank terminals. 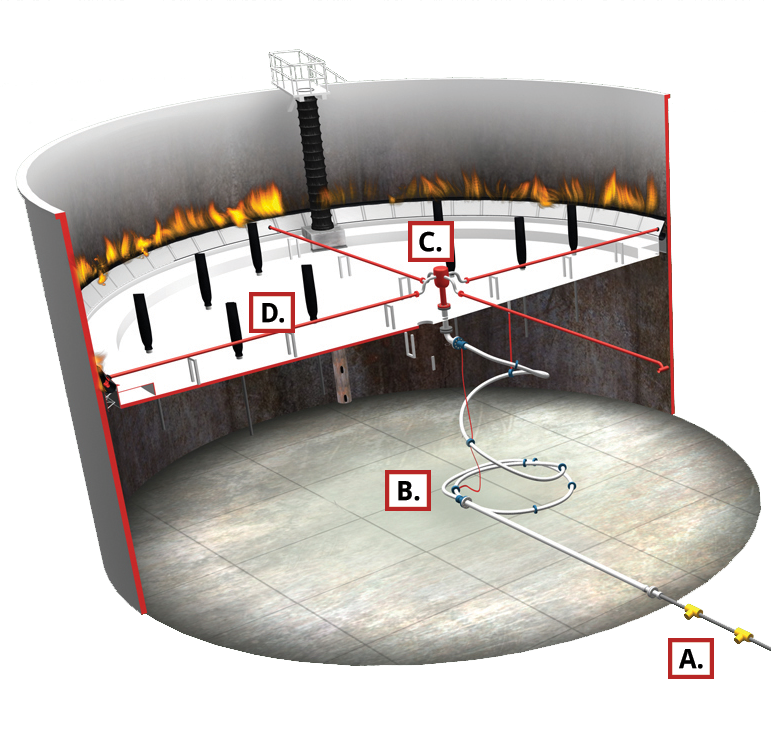 Mesa ETP’s foam delivery fire suppression system is designed to provide fast delivery of fire extinguishing foam through pipelines in the center of the tank and directly out to the tank rim areas. The standard Mesa ETP foam delivery fire suppression system is designed using RESIST-ALL-CLAD® Flexible Pipe. RESIST-ALL-CLAD® is designed for continuous service in a wide range of pH solutions and chemicals. It is completely compatible with pure M.T.B.E., 100% aromatic hydrocarbons, pure alcohol, gasoline and jet fuels. RESIST-ALL-CLAD® features a fully controlled, repetitive lay pattern (multiple coil). RESIST-ALL-CLAD® assemblies offer a service life expectancy of up to 20 years provided the system is sized, installed and operated in the designed service. RESIST-ALL-CLAD® features a tether system that keeps the drain in position as installed. Tethers are attached to the underside of the floating roof and between ballasts on the flexible pipe for a precise lay pattern. From the proportioning and pumping equipment positioned outside the dike wall, a high back pressure foam generator is used to direct fire extinguishing foam through rigid pipe to the base of the tank shell. The pipe passes through the tank shell and extends to a point near the center of the tank. Mesa ETP's RESIST-ALL-CLAD® smooth bore flexible foam line is attached to the rigid pipe within the tank and is connected to a double flanged spool piece mounted to the roof. On top of the roof, a multiple port foam distribution manifold is mounted to the spool piece. This manifold is sized according to NFPA guidelines, which determine the required G.P.M. and number of discharge outlets for the tank’s diameter and seal rim space area. 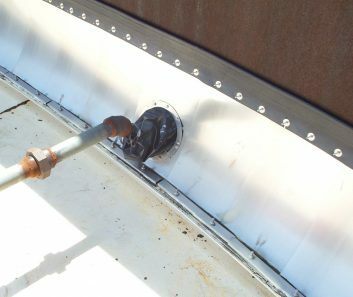 From the distribution manifold outlets, flex-connectors and radial piping are used to transport the foam across the floating roof directly to the rim seal area regardless of the position of the roof. Consult NFPA 11 Standard for Low-, Medium-, and High-Expansion Foam, which covers the design, installation, operation, testing, and maintenance of low-, medium-, and high-expansion and compressed air foam systems. The primary and secondary roof seal area is a critical point in the system design. Above seal applications require a foam dam and normally a longer discharge time. 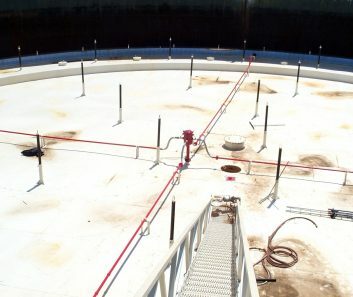 If the tank is equipped with a secondary seal made from a non-combustible material, the foam can be discharged below the secondary seal and will not require a foam dam. This enables the system to discharge 100% of the foam over the rim seal area in the shortest time.